It was founded at the end of the 15th century by Cardinal Cisneros as a monastery of Franciscan nuns, a school for maidens and a women’s hospital. It was located on the current street of San Juan, where the nave of the church, restored as an exhibition hall and now known as Casa de la Intervista, has remained from the old convent. Areas of what was once a convent in Cardenal Cisneros School and in the municipal offices located next to the aforementioned exhibition hall are also preserved. Since 1884, the convent of San Juan de la Penitencia is located in what was the Augustinian convent school of San Nicolás de Tolentino, built in 1616. 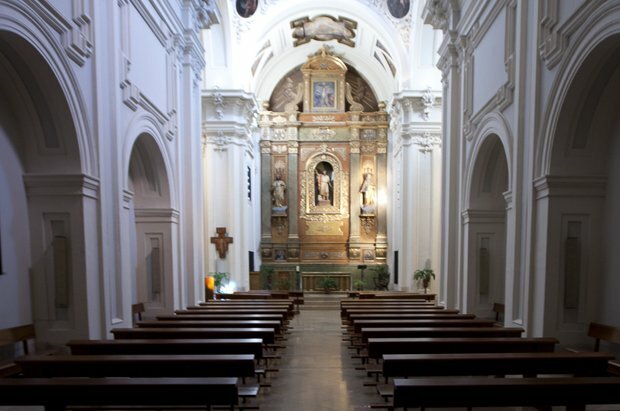 The interior of the church is a beautiful example of Baroque architecture in Madrid. The small oval sacristy of the eighteenth century, located on the side of the epistle, is striking. In this space, we can admire the convent museum, in which pieces stand out, such as a copy of Cisneros’s testament, the Cardinal’s staff, his breastplate and works of art from the 16th and 17th centuries. The nuns of the convent of San Juan de la Penitencia de Alcalá de Henares were the testamentaries of Cisneros, which is why they keep these memories of the Cardinal.